Today I'm doing the Mystery Blogger Award. I was nominated by the awesome Hanna, from Hanna Reads, thanks so much for the nomination. Drop by to see her awesome blog as well. 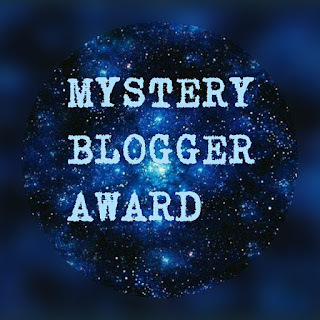 "Mystery Blogger Award" is an award for amazing bloggers with ingenious posts. Their blog not only captivates; it inspires and motivates. They are one of the best out there, and they deserve every recognition they get. This award is also for bloggers who find fun and inspiration in blogging; and they do it with so much love and passion. I'm currently training to run a Night-Run with colours and music in Rotterdam which is 8km and in October. After that I hope to run a 15km run, over 7 high hills in Nijmegen, also in The Netherlands. I'm doing this together with the head of my Primary School and we run after school when the classes are over! It's so much fun to run together with someone and have a goal to work towards. I'm moving on October 2nd! I'm currently living in quite a "new" town in The Netherlands, but I bought a house in one of the oldest cities! I love it so much, with the old houses and the lovely city square, parks and cafes! The house that I bought is actually built in 1910 and renovated in 2016. It has a FIREPLACE, guys! I can't wait to buy a great lounge chair and put it next to the fireplace and read there in winter. I'm collecting a never-complete a set of dishes from the brand "Blond Amsterdam". It's actually a tradition with one of my best friends to gift each other something from this set every year on our birthdays! 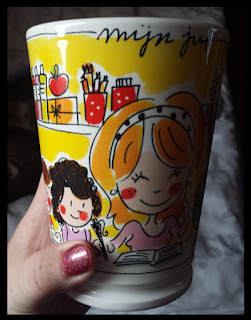 (see picture below, it's a mug I got from one of the kids in my classroom). Do you eat or drink while you're reading? I usually drink tea/coffee or water while I'm reading. I sometimes read while eating dinner when I'm alone as well. It's depending on the time of the day. If I decided to eat and I want to read as well, I'll combine the two. I never eat because I'm reading, it's more that I read because I just don't want to put the book away! What's the format you prefer with your books? And why? It depends. I like hardcover best. You don't have to hold it and can put it in your lap and you have your hands free to do whatever (pet your cat). When I'm in bed and I don't feel like going out to turn off the light, I like my Kindle better, so I can read in the dark (I have backlight on it). Do you prefer complete silence while reading or do you need some background noise? I don't like other people talking/laughing, it distracts me! I love some music in the background so it's not totally silent. If you could recommend me one book that I would HAVE TO READ one day, which one would it be? What's the last book that made you cry so hard? What's the last book that made you laugh so hard? 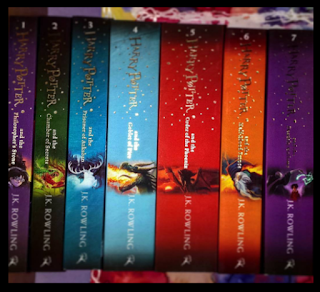 What book/bookseries are you most proud to have on your shelves? What's the last book that you DNF? Thanks once more to Hanna for nominating me! I loved writing this post and nominating others. Thanks for reading, and see you soon!